Glass is a versatile building material. It has good isolation properties and at the same time provides daylight to offices and living space, which makes us feel pleasant. Glass facades allow an architectural appealing design of buildings on the outer surface of the building as well as inside, where panoramic views optically enlarge rooms and provide a enjoyably varied view for people inside. New building materials and detailed static calculations enable a modern open-space interior style, where walls as load bearing elements can be reduced which allows the application of large glass surfaces especially in the exterior shell of the building. Large glass facades, however, can become a disturbing element for the immediate environment when they reflect dazzling sunrays. Glass surfaces can reflect and redirect light, causing the illumination of normally shaded places, or causing the light to irradiate from unusual directions. Optical elements, such as glass, are liable to bundle light and its heating effect, a matter that has already caused problems in isolated incidents (see link). Solar panels too - their surface is made of glass - have been reported to cause unreasonable glaring, resulting in the removal or necessary alteration of the solar field. Even though glass is intended to let light pass through (transmission) a smaller part of the light is filtered (absorption) and another part is sent back (reflection). The share of light which is reflected, increases when the incidence angle (the angle between the light rays and the glass surface) is flat. During the course of a day, with its many positions of the sun, this will be the case for many surfaces. Building Facades are typically vertical (with a few exceptions). The causes the sun rays, which mostly come "from above" only to be redirected in its direction, but not in its elevation. Solar Plants for comparison, have the tendency to redirect light from above horizontally (caused by their typically sloped inclination angle). The resulting horizontal glare can be particularly disturbing for drivers or neighbours, because they cannot protect themselves as easily from these level rays as they can from vertical light. Vertical facades thus do not redirect light horizontally, causing the rays to hit the ground in relatively short distance, where they typically do not cause any harm. Vertical surfaces can only cause wide range reflections at sunrise or sunset. A dazzling effect can however also be caused by particularly large glass facades, especially when they are close to the point of immission. In Mondsee, Austria, an existing building was planned to be modernized with a continuous glass facade around it. 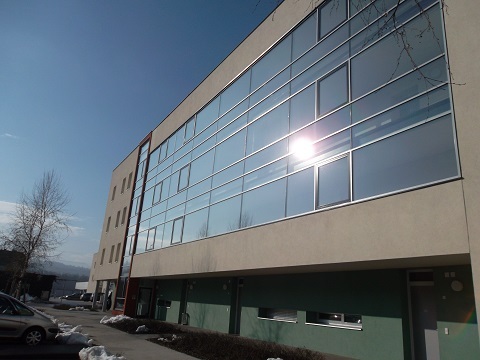 Due to the fact that the structure is near to the highway A1, where also several on-ramps and off-ramps to the autobahn are located, a solar glare assessment was needed to obtain the building permit. The glass facades do surmount the autobahn clearly, making them very visible and increasing the potential for reflections. The Glint and Glare Assessment revealed some short reflections in the direction of the vehicles. However, these were rated as non-critical, due to the fact that the distance to the points of immission was relatively large and that the reflexions will also be limited locally to a short section on the road. The position of the reflection in the field of view of the drivers too, has been an important factor in the assessment. Light descending sideways, pose no danger for the driver who keeps his eyes on the road. Consequently the glaring expert was able to issue a green flag for the construction of the glass facade without further provisions.